Why is it, that when Peasnap Catering (you know, that unlikely pairing of my husband and my mother, sounds like fodder for a reality show) needs help, I take off from my cushy desk job and pitch in? Not that I mind helping. I enjoy working with the food stuff. Maybe a little too much, but that's not my point. My point is - who helps me at my job? Who is there when I have to be in three places at once, or I have to work late every night for a week? In case you haven't gathered, I'm going to the auction tomorrow. My aunt's mother-in-law passed, and she (the aunt, not the mother-in-law) hired us to cater the funeral - no, I'm not kidding - so my mom is going to do that, while I fill in for her in the cafeteria. Looking over the menu for tomorrow, I think I'm going to have some herbed chicken breast and vegetables, and I'm actually looking forward to it. Jason, mom, and dad catered the visitation tonight - at the funeral home - while I stayed home with Anna Marie and made the cupcakes for her birthday. No, it's not until Thursday that she'll be taking them to school, but she's also taking some to church on Wednesday night and I know I won't feel like cooking them tomorrow. 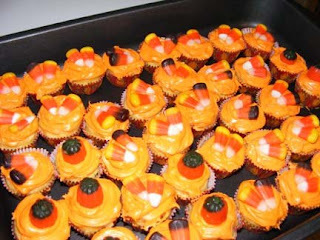 I'm no Amanda Raney, but those are (Pillsbury Reduced Sugar) yellow mini cupcakes with vanilla icing I tinted orange, and candy corn or pumpkins on top. I also sprang for cupcake liners this year, since I figured out that not even silicone bakeware is completely stick-proof. They're cute and fall-themed. It's my mom's birthday today, but she's going to have to get Amanda to make her something. I'm all tapped out. It's a good thing I only make these things about once a year - otherwise, due to my penchant for licking the bowl clean, I'd be bigger than a house. Especially since Jason has discovered Caramel Candy Corn! So, remember two days ago, when I was all freaking out about the impending seventh birthday of everyone's favorite red head? Random door-to-door solicitor to the rescue! And what was he selling? Cedar Hill Farms is just a few miles north of here, in the next county. Anna Marie had brought home a flier from school this week, and asked to go. And then this guy comes by, and sells me 10 tickets for $30, which would cost me about $15 each if purchased separately. (Serendipity!) And with those tickets (which he assured me can be used all at once if I so desire) we can go on hayrides, and through a corn maze, (or MAIZE as they cleverly call it) and all sorts of other fun, fall-ish stuff. And I'm pretty darn excited, because they have picnic tables, so we can just bring some food and have ourselves a good old time. Now all I have to do is figure out a date and a time, and narrow down the 10 guests, and we're all set! Wow, I'm getting a really scary looking warning at the top of my posting page, telling me about a scheduled outage at 4 p.m. PDT - let's see, that's, um, carry the two, divide by four - 6 p.m. local. Hmm. Is that today, or tomorrow? Guess we'll find out. Or, we've found out already. Whatever. I gained a pound this week, taking me back up to 147. The nice WW lady urged me not to be upset, and I was all, "Pshaw! I've been doing this three years! A little ole pound isn't going to get me down!" So I keep doing what I do, and occasionally throw in a fancy dessert plate at a fancy fashion show luncheon, and life keeps on rolling. And I try to roll with the punches. 1. According to QVC, we have approximately 90 days until Christmas. And I have made no preparations! What is wrong with me? 2. It is four days until my mother's birthday. And I have made no preparations! What is wrong with me? 3. IT IS ONE WEEK UNTIL ANNA MARIE'S BIRTHDAY. AND I HAVE MADE NO PREPARATIONS! WHAT IS WRONG WITH ME? Once again, we probably won't have a birthday party for Anna Marie, because, well, we still have some rather awkward family situations, similar to last year but also somewhat different. And once again, the magazine has taken all of my energy (and it STILL isn't quite done yet). So I'm trying to make it up to her, by taking her to the circus that's coming to town the next week. Also, she has fall break and a doctor's appointment that next week, and I'm planning to take her fall break off from work and maybe use our buy-one-get-one-free Japanese food coupons to get her first Hibachi dinner. Maybe, one of these years before she leaves the house, the awkward family situations will cease, and she'll have bonded with some of the kids at school or something, and the magazine won't bleed me dry, and we can have a proper party. Maybe. Or maybe, this pattern will repeat itself year after year, and Anna Marie won't have any memories of birthday parties, but she will have done every special event in Memphis and the Mid-South. I joined Facebook last week. Go on. Check if you don't believe me. I don't know what made me do it - I think it was all the people complaining about the "new" Facebook as opposed to the "old" Facebook. And quite honestly, I don't know the difference since I joined after the change, so it isn't a big deal to me. Back to my point - I now have a Facebook. Complete with pictures. And friends. And Flair! Even some Flair that has Anna Marie's picture on it - how cool is that? Is it wrong to admit that I'm actually kinda enjoying Facebook? That I wish that I'd made the plunge a long time ago, just like I wish I'd watched Arrested Development a long time ago. If loving them is wrong, I don't want to be right. Anna Marie had an appointment at her eye specialist yesterday. The office is about 30 miles north of here in the next county. She and Jason left straight after school, while I still had to finish my pages at work. I left work a little early, since I'd taken a short lunch break; stopped at the grocery store; and was about to start dinner when I got a call. "I need you to come get us," said the voice on the other end. "I think the clutch cylinder on the Jeep is out." The Jeep. The vehicle that was just fixed two days ago. That a friend helped him put back together in exchange for his looking over a computer. The Jeep that not only ruined a pulley and the water pump with its little stunt last month on the highway, but also locked up the new alternator that was put on it in South Carolina. I turned the oven off, put the muffins I'd mixed up in the fridge (we were to have breakfast for dinner) and drove up. Since we were all starving by that point, we went to Zaxby's (where the nice manager lady agreed to let me have all celery with my wings instead of fries!) and on to the parts store to get some brake fluid. My dad had suggested that Jason put the fluid in the cylinder and try to get the Jeep back home. Problem was, the fluid went in the top - and right out the bottom. We called for my dad, who was eating dinner. He and my mother arrived on the scene about 45 minutes later, which would make it about 7:30 by this point. Somehow, my dad got the Jeep home by switching gears without using the clutch. Jason drove dad's truck (because my mom had forgotten her license) and we three girls rode home in my car. Oh, and of course, when we took the Jeep to mom's, Anna Marie stayed. I've just finished baking the mini muffins, so maybe we can have them with dinner tonight. If Jason doesn't eat them all when he wakes up, that is. I need to get in the shower, because it looks like I'm going to be driving my mom to the chiropractor this morning. Is that how I envisioned spending my Friday night? Nope. But like I told Anna Marie, it could've been much worse. We were in a parking lot, not stuck on the side of a road like I've been so many times. We had just eaten dinner, so we weren't starving. I had my car, so we could leave and get the stuff we needed. And she and I took a lovely walk in the cool fall weather around the shopping center, where we saw multi-colored appliances, and a baseball game playing on the TV in a sports bar, and the most paint samples that she'd ever seen. And, most importantly, we were together - which I guess is what really matters after all. Well. Here we go again. Tonight's weigh-in was actually the bright spot in my evening - I lost 2.5 pounds this week, taking me down to 146! My WW leader told me that in just 11 more pounds, I'd be at the top for my weight range, and I could make lifetime - the most important part of which would be that as long as I didn't gain more than two pounds, I wouldn't have to pay! It would be like getting a raise! That was the BEST news I'd had all day - especially since I'm trying to work on an assignment which I seem unable to complete to my boss's satisfaction, and I thought TODAY was picture day, so I sent Anna Marie in her favorite red polo, only to learn that TOMORROW is picture day, and I seem unable to find a shirt that is up to her high standards. Folks, I even went to far as to go to Walmart after my WW meeting to buy her a NEW shirt, because she was crying so hard when I left. Except, she was STILL crying when I showed her the new shirt, because it wasn't what she wanted. 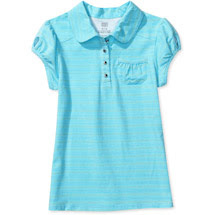 And I'd apparently promised her that she could wear the red polo in her pictures, and that wasn't happening. And she's made no secret of how upset she is with me. And she's been crying for the past hour and a half. And at this point, she'll wear whatever I present her with in the morning. Just wish I could say the same for my boss. I don't know what's come over me, but I woke up feeling really icky today. I had to take Anna Marie to work with me today, because they're having teacher meetings and I didn't want her to miss her dance class this afternoon by going to the auction. So, she stayed in my office for about 30 minutes while I went to a meeting, and then I made sure the magazine revisions were uploaded, and then we left. And I still feel blech. And she wants me to play Monopoly with her, but all I want to do is lay in bed. And in about an hour and a half, I have to wrestle her into her tights and take her to dance. And then I've got to have her at church by 6 p.m. to get ready for a special something-or-other that I found out about last night. And she isn't taking my "tummy ache" excuse for a reason not to play the board game, so here I go. Hopefully, I won't pass out from the blech at the dining room table. I don't think I match the new tiny lampshades and curtains very well. Because my contacts are EXTREMELY dry, and I'm EXTREMELY tired, and yet, here I am. Posting those pictures from last night. If you've never been to Pei Wei, I highly recommend it. I got a kids meal of teriyaki chicken, with brown rice. Great, except they made me buy a $1.75 adult drink instead of a 50 cent kids drink - but I still got out of there pretty cheap, and without having to worry about eating too much. 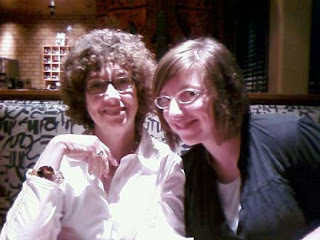 Here is my Mom and Amanda. Aren't they cute? Almost as cute as Fernando Ortega was earlier in the night! 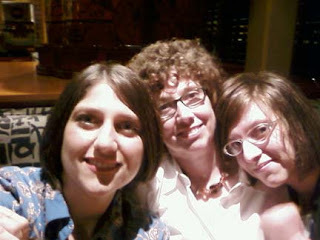 And here is all three of us. I know - I look HORRID. I promise my hair looked decent when I left the house, but then a huge wind blew it to kingdom come as soon as I got out at the church. I also regret that I only has my camera phone with me, which Amanda assures me is the reason these pictures turned out the way they did due to the lack of flash. Ok. That's it. 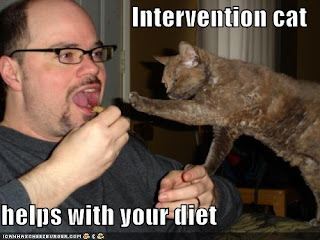 That's all my obligation to the blogosphere for today. Now off to bed! Did I hear someone say they wanted pictures? Oh, you there in the back. I heard you! And I'm happy to oblige. 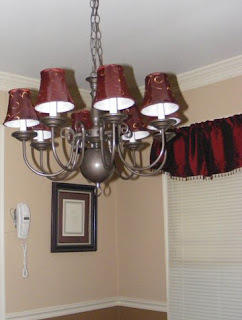 Here are the pictures I took JUST THIS MORNING of our new chandelier. I'm glad I waited, too, because you'll notice the new curtains on the window in the background! Yes, we've managed to live in this house for four years and never adorn that end of our living space. But now it's official - all the windows have curtains! Hooray! 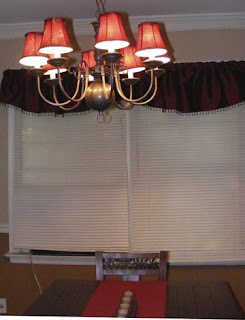 Anna Marie says now our dining area looks even more fancy with the curtains than it did before. If we get any fancier, I just don't know what we'll do with ourselves. Speaking of Anna Marie (nice, segue, huh?) she handed me this photo when I picked her up from children's church yesterday. It was taken last week at Biker Sunday (naturally.) 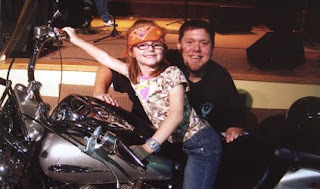 That's Pastor Bob, our childrens/assistant pastor, and his Harley that he rode into children's church. She said not all the kids got their picture made on it - just the ones who wanted to, and of course, she wanted to. She also wanted to make sure I was going to put it in my "picture book" (a.k.a. scrapbook.) I think I see some Harley Davidson paper in my future! I was going to post some pictures I took with my phone at Pei Wei in Memphis last night, after Mom, Amanda, and I attended a Fernando Ortega concert at a church there. Alas, I could not get the computer at home to recognize that I'd plugged in the phone, so I couldn't get them off. Perhaps Jason will help me later, and you can be so jealous of the fun we had. I uploaded the magazine on Friday afternoon! Hooray! There will be revisions and re-sends, of course, but that is a HUGE weight off of my shoulders. No, seriously - I literally felt lighter after I was finished! Hopefully, some of that will show up at the scales on Thursday. Anyway - over at The Parent Bloggers Network they're having a contest! With help from Capitol One! And the prize is an iPhone! And all I have to do is tell you how I'm teaching little AM about money. Easy peasy, lemon squeezy, right? I mean, come on - just look at what I've already posted this week! It's destiny! So here's the question: when do you start teaching kids about money? My answer: as soon as you get the hospital bill. Kidding! I'm kidding! But I do think that the earlier, the better. I've already discussed how I have to choose my words around Anna Marie. She, like most kids, doesn't understand the concept of money very well. For instance, I can't tell you how many times she's asked why we haven't gone to Walt Disney World. And my answer is always the same - because we haven't saved enough money. And her answer is always the same: then why don't I go to work, and make some more? Oh, if only it were that simple. Just like it's difficult to teach kids that having a checkbook full of pieces of paper with your routing number on them doesn't guarantee sufficient funds to buy stuff, it's difficult to make them understand that just because you earned some money, doesn't mean you can spend it willy-nilly. There are wee small roadblocks to that philosophy, and around these parts we call them food, shelter, and clothes. We've already made her start saving for things she wants that are extra (like Webkinz or Build-A-Bear). And now, I'm going to follow Karen's suggestion that she save for that Nintendo DS she wants. This morning, I had a talk with her about saving. Because when I wanted an iPod, I had to save for it. And when her dad wanted a Zune (and for the love of Pete I can't figure out why he did) he saved for it. So if she wants that video game, she's going to save for it. Her birthday is in a couple of weeks, so she's going to ask for money and/or Target cards. In fact, I have a $5 Target card I got for buying a bunch of Kashi stuff this week, so I may give that to her for seed money. During football season, the cheerleaders come around selling ribbons and tattoos. And if she stays on "green" enough during the week, she gets money for that. But now, she's got the option of using that money to save for her DS. And, she thought that was a great idea! Instead of telling her we're broke all the time, I try to couch it in terms of "priorities." Because I could take the rent money to buy an X-Box, but then we'd have a little trouble the next time it rained. Shelter is a priority! And, I could take my tithe money each week and buy her something with it, but one of our priorities is honoring God with our finances. It's hard to teach her about priorities when SpongeBob is sponsored by the Evil Toy Conglomerate and her friends are getting iPod Nanos and cell phones for Christmas in kindergarten. But I think that's the best way to teach kids about money - not scaring them into thinking that they won't know where their next meal is coming from if that isn't an issue, but letting them know what your family values and chooses to spend its money on. I'm beginning to feel like I don't even DESERVE to have these things, because I'm apparently NOT FOLLOWING DIRECTIONS very well. Like the directions that tell me that finishing off the bucket of cookie dough you're supposed to be spooning out onto baking sheets is not a healthy way to eat. Anyway - I gained a half pound this week, which could also be attributed to the fact that I ate something a full two hours later than I normally do on Thursdays, and that food was still in my system. Pay no attention to the woman with the bucket of cookie dough and the spoon. Really, aren't they all that way? Karen left a comment laughing about my using the term "out of my budget" when telling Anna Marie why we can't (or won't) spend money on something. I have a very good reason for choosing my words carefully - and apparently, Jason hasn't learned that lesson yet. Did you guys ever hear the phrase "cash-free society?" Well, if you have small children, it just isn't true! Since she's started school, we have to keep cash on hand several days a week for lunches, or "snack store," or the ribbons the cheerleaders come around every Friday peddling to unsuspecting youngsters. Add to that the need for offering on Sunday, and you see my point. Problem is, we don't carry cash - and haven't since before we were married. We started using our debit cards in college, and haven't looked back. Want to know why we never go to the Waffle House here in town? Because they don't take cards! So, this weekend (as you've already read) we were pretty busy. And on the way to church Sunday, Jason fished around and found a few cents to give Anna Marie for her Sunday School/children's church offering. "That's all the money I have," Jason innocently responded. As soon as he said it, I knew he'd messed up. I KNEW where her mind would go, and tried to issue a correction - it was all the cash he had. It fell on deaf ears, though, because Anna Marie went into panic mode. "But how will we eat Backyard Burgers on Thursday?" Yep. She didn't worry about food that day, or the days between Sunday and Thursday, or even how we'd put gas in the car or pay the other bills. She thought her weekly "date" with her dad was in jeopardy. Kids eat free at our BYB on Tuesday and Thursday nights. And every Thursday, while I fast before weighing in at my WW meeting, Jason and Anna Marie go across the street for dinner. Folks think it's so cute - the two of them out like that. They don't know it's because she's eating free, and he doesn't want to have to cook! We don't even have to spend gas money to get over there, because, as I've stated about a bazillion times before, it's literally in my back yard. Unless the weather is bad, they walk! And I don't want Anna Marie to think we're destitute all the time. I'm just cheap, or the item in question is something that we just don't want to buy. So I tell her it isn't in our budget - which is completely true. Especially when it comes to the Nintendo DS she's been asking for, or the iPod Nano, or the cell phone. Totally not in our budget. So let that be a lesson to you, all those who deal with small children - think before you speak! You could have a very panicked child on your hands! And it was connected with a speeding train. Anyway - I got home Friday night, and Jason informed me that we had a catering job on Saturday. 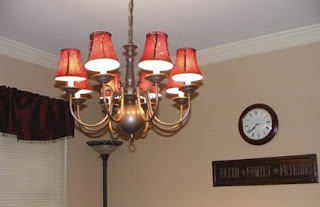 And, those two facts together somehow meant that we had to make a trip to the next county, to look for tiny lampshades to put atop the lights in the chandelier. Saturday, we went to another two stores, where we found a few to add to those we ended up buying down here. So now, tiny lampshades inhabit my dining area. Pictures? You want pictures? Well, then, you're going to have to wait for another post, my friend! So, Saturday was super-busy too, and Sunday - well, let's just say that we left home about 9:00 a.m. and returned about 8:30 p.m.
And just when I thought I might have a few minutes to catch my breath, I realize that I have another special section due in two days, and the magazine still isn't sent to the printer yet. Good thing I had that second round of coffee at lunch today. Ok, so this is a bit of a shameless post. I'm trying to win an iPod Touch from The Networking Masters and this is all part of the plan. Now, if only I can beat Heather@Desperatelyseekingsanity to the punch - but she's way better at networking than I am, so this may be a lost cause. Seriously, I've been thinking that I need to up my networking game for some plans I've got spinning around in my head. And speaking of "head" - head on over to that link, and good luck! Am I EVER going to get finished with this magazine? I mean, I know I wasn't wanting to overstress myself to get it put down last week, but now, it's feeling a bit ridiculous. Hopefully we'll get something accomplished on it tomorrow, and by "something" I mean "finished." Anyway - I gained a pound this week, so I now weigh 148. So now you understand why I had to put all that other stuff at the top of this entry, because I didn't have very good news to report at all. Aren't there TV commercials that state that just the act of being stressed makes you gain weight? And you know if it's on TV, you can believe it! "Mom called. Harold Staubitz died." I was immediately taken back to South Carolina, where we lived for four years before moving to Mississippi. Harold Staubitz and his wife were members of our church. Three of their four children had also attended there at one time or another. Jason taught piano to one of their granddaughters when we first got married. He was retired - maybe on disability. He had pretty bad diabetes, which may be what finally took his life. Jason said he'd heard that Harold's leg had been amputated in recent years. If my memory serves me correctly, he was having a particularly bad time with his health when I was pregnant with Anna Marie, and Jason was visiting his hospital room on September 11, 2001 when I called to tell him what was going on. I don't know what his ethnic background was, but he was always speaking Italian and making pasta e fagoli for our church's annual Super Bowl Soup and Salad Supper. When we had our housewarming party after we got married, Harold brought a gift bag containing some salt, and a loaf of bread, and some sparkling grape juice (since we don't drink). He told me what each gift represented, but for the life of me, I can't remember just now. As I lay in bed last night, unable to sleep, I couldn't help but smile at his memory. He and his wife (who worked at the Dollar Tree in town) would come by and help me at the soup kitchen I ran, sometimes volunteering if I had to be off for a doctor's appointment or a church trip. His diabetes left him with a good bit of nerve damage, and he shuffled a little when he walked, but that didn't stop Harold from trying to help the less fortunate. Their daughters started riding the bus to church when they were small, and after years of coming to see their kids in church activities, the parents finally asked Jesus into their hearts and started coming as well. He loved to hear me sing - he called me a maestro - and when his three-day-old, premature granddaughter died, he asked me to sing It is Well at the service. And yes, that was at least as difficult as you would imagine it to be. He and his wife always had a kind word, and I'm sure that packed up somewhere I still have the porcelain baby shoe they gave Anna Marie for a shower present. I've often wondered how they were doing, and I guess now I know, at least in part. When I get home tonight, I plan on finding a card to send to his wife. And for a while to come, I'll be remembering Harold Staubitz. Did we finish the magazine on Friday? But we also didn't stay in the office until midnight like previous years. I'm a little tempted to go in today and work on it - oh, nevermind. The moment passed. I did wake up entirely too early this morning, after staying up entirely too late last night watching the Clean House 100th episode special. Good thing Anna Marie was at my mom's, because she hates that show. We're having a good weekend so far. On Saturday, Anna Marie and I met one of my cousins and took our kids to see a production of Sesame Street Live. Before we got to the venue, though, I got a call on my cell phone. It was our childrens/assistant pastor, Pastor Bob. He said that the church had bought an ad in that county's paper to promote this weekend's Biker Sunday, but that it hadn't come out on Saturday like it was supposed to. Pastor Bob said they'd been trying to get a reporter to come cover the event, but couldn't find one. And then he remembered that I'm a reporter! So he asked me to bring my camera and do a story for them to submit to their paper. Yesterday's service was a blast! Anna Marie was so excited, because she got to wear jeans and a bandanna to church. Most folks were decked out similarly, except for Jason - he stuck to his old standby of khakis and a polo. There were bikes everywhere - in the lobbies, on the sidewalks, and in a big group in the parking lot. I thought that the volume of the praise and worship sounded louder just because I was sitting on the front row waiting for the motorcycles to come through, but Jason said it was loud further back where he was too. Also, the set list included Evanescence and Daughtry. Slightly modified, of course, but still - we rocked. And then, just before the sermon - three motorcycles entered the sanctuary! And then, a big burly tattooed guy got up and told everyone how much God loves them, no matter what they've done or where they've been! Pastor Bob rode his bike to children's church, too. Anna Marie said he did a few laps around the room before coming to a stop. I sent my story in to Pastor Bob last night. My pictures didn't turn out as well as I'd hoped, but I guess they'll realize that I'm a better writer than I am a photographer. Last night, we had a Labor Day picnic at the same deer farm where we'd celebrated Memorial Day. Except, it was SO much hotter! Anna Marie got there and went directly to the sand volleyball court. And then on two hayrides - without us! The Kid was so busy playing, she didn't even eat dinner! I had to heat her up a frozen pizza when we got home. Like I said before, she's at mom's, so I don't know how she slept. After a day filled with motorcycles and volleyball and hayrides, I'd venture that she's pretty pooped - but then again, she is Anna Marie, so anything is possible. Speaking of being tired - I just realized I forgot to make my coffee this morning. The lack of caffeine is starting to kick in! I'd better go remedy the situation - stat.